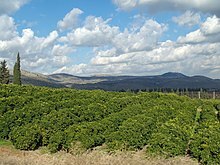 A lemon orchard in the Upper Galilee in Israel. An orchard is where trees or shrubs that produce food are grown. Fruit, nuts, and vegetables are grown in orchards. They are grown to be sold. Orchards are sometimes a part of large gardens. They are put there to look nice and to produce food. This page was last changed on 29 August 2014, at 13:49.